With Spring having officially arrived today – hooray – I thought this was a nice guest post to look at to make us feel more Spring like. And who knew you could get cushions you can leave out all year round! Enjoy! Traditionally rattan furniture used to grace conservatories and sunrooms. A pleasing natural product producing light and comfortable chairs, but one which would rot if left out in the rain. The arrival of synthetic rattan on the market, however, has completely revolutionised the world of outdoor furniture. 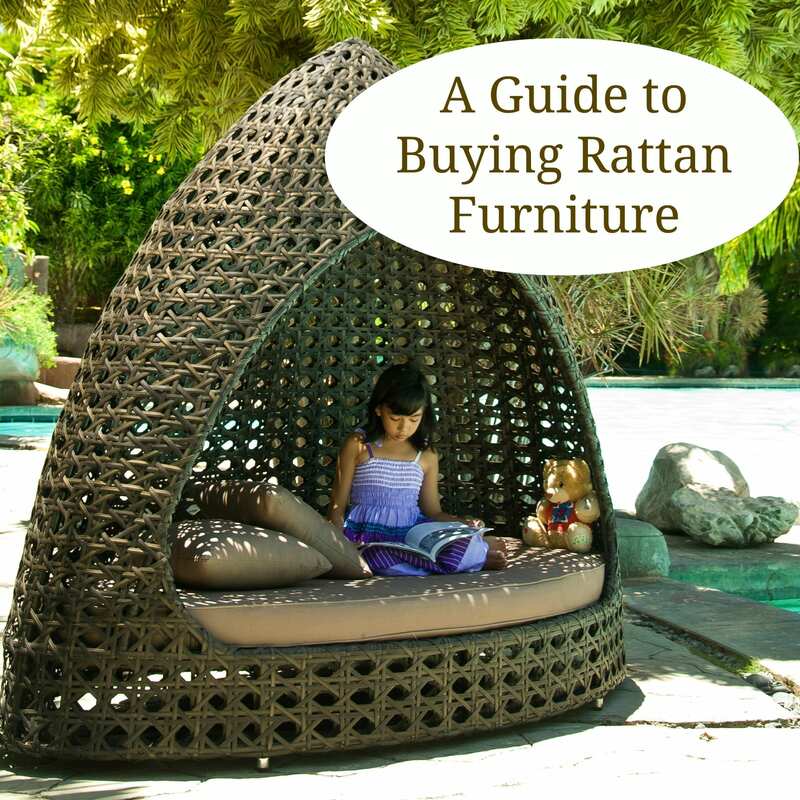 In fact, when a product is described as rattan nowadays it is most likely to be of the synthetic variety. Synthetic rattan incorporates all the advantages of the natural product with none of the disadvantages. This furniture, which is virtually maintenance-free, can be positioned outside all-year round and requires nothing more than a light hosing down at the beginning and end of the season. Garden furniture that is to be left in situ during all our English winter (and indeed summer!) can throw at it, needs to be of a good quality, so this guide aims to help you choose from the vast array out there. 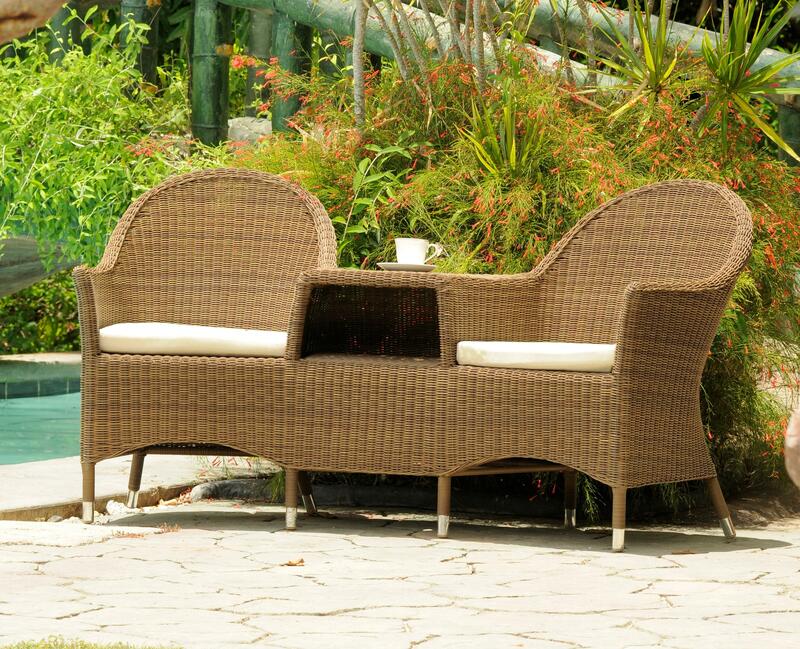 Synthetic rattan fibres are made either of PVC or of high density polyethylene (HDPE) and come in a range of qualities. HDPE is not only more durable than PVC, it is also environmentally friendly, so it is evidently the material of choice. In general the most hardwearing fibres are the thicker ones, 7 or 8mm for example, although some designs, while still being high quality require a lighter fibre. The guarantee will give you the most accurate way of distinguishing durability, as warranties can vary from one to ten years. All the synthetics should also have weather resistance but you need to check that they also have UV protection to prevent fading so that your furniture will retain its colour and good looks for longer. So read the small print. Weave also affects the durability of a product. In general the denser and tighter the weave the more hardwearing the item will be. Furniture is usually hand-woven by highly skilled craftsmen and a wide range of differing patterns is available. Some manufacturers of cheaper rattan furniture will try to save money by using a looser weave. As with the quality of the fibre you need to compare the guarantees. Avoid any frame that will rust. Aluminium is usually the material of choice as it has a high strength to weight ratio and does not corrode. Check that the frames are powder coated so that the silver colour of the tubes does not show through the finished product. Aluminium is also 100% recyclable, making for an environmentally friendly choice. Beware cheaper tubular aluminium however, as this is so light that it will blow away in the wind. That tiresome chore of bringing cushions in after each use can now be a thing of the past! Outdoor cushions can spend their entire life exposed to the elements, though you may prefer to store them indoors for the winter months purely to keep them clean. Do not assume that your furniture will automatically have waterproof cushions. In fact, there is no such thing as a waterproof cushion. What you should look for here, is cushions made of foam that dries almost immediately after rain, snow, dew etc. These cushions have large open pores which provide maximum drainage and air circulation whilst remaining comfortable and durable. The flexibility of synthetic rattan has allowed designers much more scope. No longer are we just thinking of garden furniture as a table and chairs, perhaps with a parasol, now you can now choose from sofa sets with coffee tables and side tables, dining sets with armchairs, bistro sets, love-seats etc. Nor does your choice even have to look like traditional garden furniture. Many of the designs are contemporary with clean lines and modern fabrics. Indeed much of this furniture would sit happily in a lounge or dining area. By using this guide you should be able to ensure that your furniture will give pleasure for many years to come. In this age of freak weather conditions, the advantages of all-weather furniture cannot be overstated. Even if our summer comes in February you will be ready to make the most of it. A Guest Post by Liz Higginbottom.